I am back with another book review, The Breakdown by B.A. Paris. Thank you so much to NetGalley for providing me with an e-ARC of this book for an honest review, as always, all opinions are my own. I had such high hopes for this book, and while I did enjoy it, the more I think about it, the more I'm seeing the predictability of the ending. This story follows Cass, a woman who may be losing it. She's been especially on edge ever since she took a shortcut home one night, one she promised her husband she wouldn't and saw a woman in a car pulled over on the side of the road. She stopped for a minute but didn't get out. The next morning, she finds out the woman in the car was found dead by a passerby later. Cass is racked with guilt and doesn't tell anyone what she saw. The police start calling the death suspicious, and Cass begins to get silent calls she is sure are from the murderer. Since her mother was diagnosed with early-onset dementia, Cass begins to fear for the worst. The book definitely had that signature Paris feeling of unease throughout the book. Cass's paranoia was infectious and I kept looking over my shoulder, especially when I was reading at night. 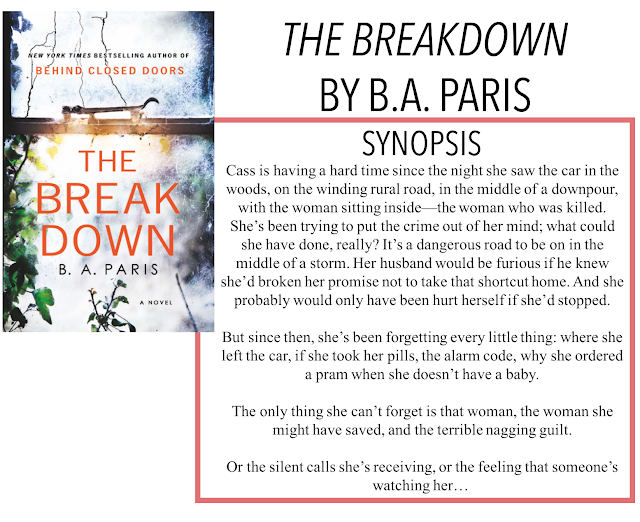 Like in her debut novel, Paris creates an atmosphere where something is off, but you can't quite pinpoint what is really going on. This review is tricky to write without spoiling anything or saying too much so I will keep things vague. Like I said earlier, I had high hopes for this book. And on almost every count, those hopes were met and exceeded. But there were just two elements I found I wasn't in love with. Firstly, the predictability of the murderer/silent caller/reason Cass was going crazy. I remember thinking on page 34 that something was up with what was going on. I didn't guess specifics, but it did make me suspicious of a couple of the characters who ended up being involved in the plot ending. I also didn't love the ending itself. While I appreciated how Paris explained how everything went down, part of me wishes she had left some things open. The ending just seemed too neatly wrapped up to be realistic. That all being said, I still really enjoyed this book. I think Paris's character portrayal was done very well, I felt like I really knew the characters of the story and could tell them all apart. I really liked the way Paris wrote Cass's characters, specifically, and I loved the inner monologues we got from being inside her head. It really added to the paranoia of the story. The pacing of the book is very well done. Despite the fact that I kind of knew what was going on, I still wasn't a 100% sure and the writing and pacing of this book kept me reading. I think I finished this book in about 4.5 hours, and I was expecting it to take me longer than it did. I was glad to see that even though I knew something was up, the book didn't become boring or dull. Overall, I would still highly recommend this book, but I wouldn't say it is as good as her debut.